Remember 1988 and the summer when England employed four captains during the five-Test series against West Indies? It seems remarkable now but it did happen – Derek Pringle also took over once as cover when one of the four captains was indisposed – and there were plenty of players used also. This against a transitional West Indian side some of whose finest batsmen and bowlers had retired. On paper and twenty-seven years later, it still looked a plenty formidable line-up but at the time there was hope that England might even just cause an upset, having a decent batting line-up themselves. I have read other recently-published cricket books recently on this general area and was initially slightly concerned that the setting given for this 1988 series might have been slightly touching similar ground. I am pleased to say that this turned out to be unfounded and Neil Robinson’s research and writing on the background to this bizarre series is both meticulous and engaging. 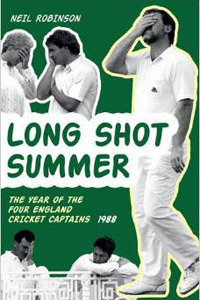 The four captains appointed during the series – Mike Gatting, John Emburey, Chris Cowdrey and Graham Gooch lest anyone forget – were interviewed and the book comes over well. Taking the reader back to the fractious Pakistan and England tour, the England selectors made it clear that further transgressions on and off the field would be unacceptable and Mike Gatting’s captaincy tenure ended after media revelations with a bar woman during the First Test. Neil Robinson has made his own investigations, interviewed the lady concerned and it is fair to say that she, like Gatting, has suffered misfortune since and that the frenzy during this period was at best unhelpful to both. For the record, England drew that first Test bringing a halt to two successive five-nil drubbings at the hand of the West Indies. The situation quickly became more parlous and the last four Tests were all lost although it should be remembered that, at times, England more than kept in touch with their, at the time, still formidable opponents. Chris Cowdrey’s one match tenure is an interesting tale but he will likely have the sympathy of readers at the manner and abruptness of his quick downfall. The chaos of the 1988 summer carried on afterwards when England’s tour of India was cancelled due to India’s refusal to accept Graham Gooch, England’s fourth captain of 1988, because of his connections with South Africa. It is a slight shame that scorecards are not included as Long Shot Summer is an excellent read. Neil Robinson is generous in thanking the late Bill Frindall for his scoring sheets of the Tests which, through his customary thoroughness and attention to detail, have brought the Tests back to life and which have helped make Long Shot Summer such an enjoyable read.